By Raymond H. Deck, Jr. 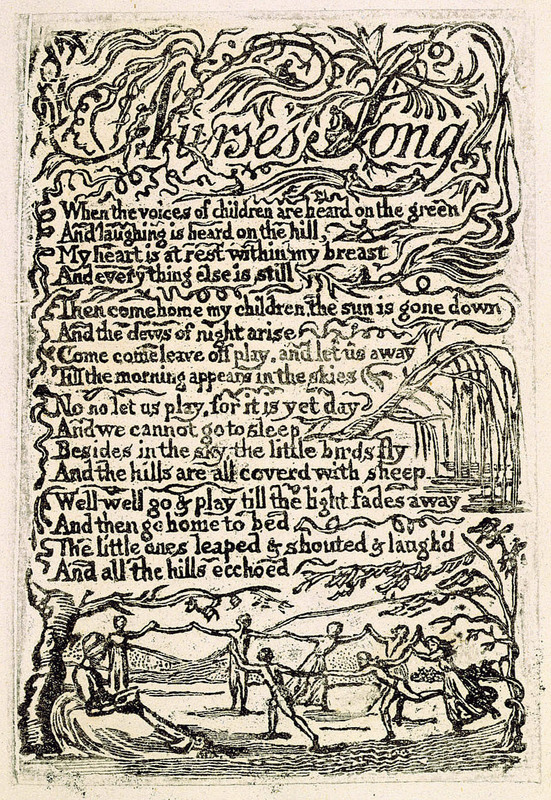 Between 1843 and 1845, Pamela Chandler Colman, an American Swedenborgian active in the production of children’s books, was responsible for printing in four separate publications nine different poems from Blake’s Songs of Innocence. 1↤ 1 My discoveries of six of Mrs. Colman’s insertions and of several other early printings of Blake’s poems have been noted in my “Unnoticed Printings of Blake’s Poems, 1825-51,” Blake Newsletter 40 (Spring 1977); with the exception of her insertions of “A Dream,” “The Little Boy lost,” and “The Little Boy Found,” Mrs. Colman’s printings of Blake’s poems have not been noticed previously in Blake scholarship. For other early printings and mentions of Blake helpfully arranged in chronological order, see G. E. Bentley, Jr., William Blake: The Critical Heritage (London: Routledge and Kegan Paul, 1975), pp. 220-69. Taken together, these printings constitute a remarkable “edition” of Blake’s poems, both for their text and for their accompanying illustrations. As we will see, Mrs. Colman did not simply reprint a selection from Wilkinson’s 1839 edition of the Songs or from Cunningham’s Lives as we might expect at this time in America; she apparently used an original copy of Innocence and chose texts which she thought most appropriate for her young readers; she even took the liberty of attributing to Blake a rather saccharine piece entitled “Evening Hymn.” Perhaps more remarkable, most of these poems, taken from Blake’s illuminated pages, are accompanied by illustrations, at least one or two of which seem to have been inspired by Blake’s etched design and which constitute a graphic interpretation of Blake’s Innocence. After presenting the illustrated text of Mrs. Colman’s “edition” of Blake’s poems, I will consider the question of her source text and finally suggest two contexts in which to view her work: the genre of American children’s books in the 1840s and the continuing interest in Blake manifested by American Swedenborgians. Mrs. Colman’s editorial career began in the 1830s, when her husband, Samuel, established himself as a successful bookseller and publisher in New York City. 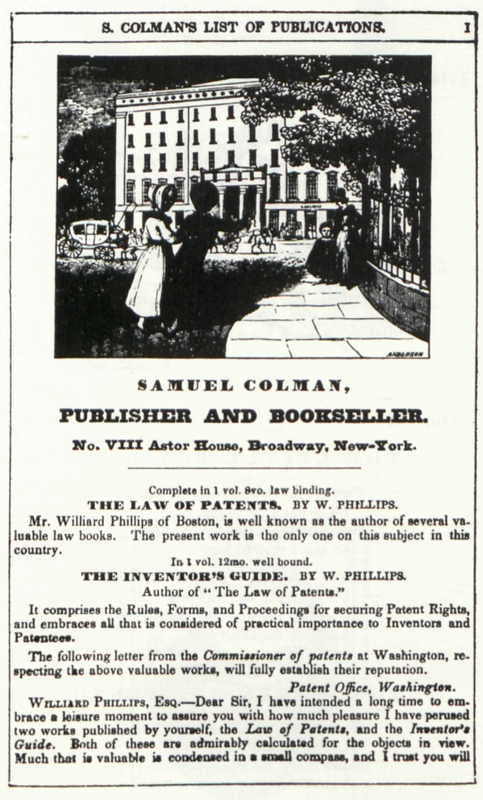 In addition to his adult publications and his sale of works by other publishers, Samuel Colman began by 1839 to produce children’s books edited, and sometimes written, by his wife. Their most extensive effort to achieve some prominence in the field of children’s literature did not begin until 1843, when the Colmans (who continued to reside and to publish other works in New York) began to publish a number of children’s books in Boston. Some of these productions, especially the original inventions of Mrs. Colman, were published by “S[amuel]. Colman” of Boston, but others, including all those with Blake poems, give on their title pages only “T. H. begin page 5 | ↑ back to top Carter & Co.” of Boston, although they were the joint enterprise of Carter and Samuel Colman.2↤ 2 Samuel and Pamela Colman are considered briefly in both the Dictionary of American Biography and Appleton’s Cyclopedia of American Biography as the parents of the American landscape painter Samuel Colman. My chief source of information about their publishing activities is the National Union Catalogue. Relevant to their New York activities during 1843 and 1844 are J. C. Palmer, Thulia: A Tale of the Antarctic[e] (New York: Samuel Colman, 1843), and a New York edition of The Little Keepsake for 1844 (see my note 5, below). For Samuel Colman’s early publishing activities in New York see “S. Colman’s List of Publications,” appended to Anon., Sunday Morning Reflections (New York: S. Colman, 1839), and his “List of Birthday and Holiday Presents Published by Samuel Colman” appended to Jane Marcet, Willy’s Stories for Young Children (New York: S. Colman, 1839), pp. 143-44. About the New York-Boston connection, one possibility is that the “G. Colman” of Boston listed as publisher of some of Mrs. Colman’s works was a relative who, in some sort of business relationship with Samuel Colman, represented the New York publisher’s interests in Boston. July 1843 Mrs. Colman seems first to have encountered Blake’s poems in the middle of 1843—probably, as argued in a later section of this essay, in an original but uncolored copy of Innocence alone. She displays Blake’s “Introduction” to Innocence very prominently as the leading piece of the July number (II, No. 3, 73-74), and she appends to the poem a short biography of the author in which she promises future selections from Blake’s “charming, illuminated volume” (illus. 2). For all Mrs. Colman’s Blake texts we can make here the general observation that they vary from Blake’s original in accidentals of capitalization and punctuation and in the normalizing of many of Blake’s contracted forms, for example “vanish’d” and “pluck’d” in his “Introduction” and “wandring” and “thro’” in “The Little Boy Found.” In Blake’s “Introduction,” our Victorian editor also has altered the “chear” of Blake’s lines 6 and 10 to “cheer” and has added Roman numerals as stanza numbers. design without reference to Blake’s original. To be sure, some of the engravings in the Boys’ and Girls’ Magazine antedated that publication by several years, perhaps the oldest being the ornamental design bordering the dedication page, which had been used as early as 1838 in The Metamorphoscope (Boston: T. H. Carter). Nevertheless, my survey of the productions of Mrs. Colman and her publishers makes clear that a great majority of the engravings in the Boys’ and Girls’ Magazine were not used earlier, although they were then frequently reused in later publications. The unusually close correlation between texts and accompanying designs supports the conclusion that new engravings usually were prepared to accompany specific texts in the Boys’ and Girls’ Magazine. August 1843 “The Blossom” from Innocence appeared at the end of the next number of the Boys’ and Girls’ Magazine (II, No. 4, 142) (illus. 5). Mrs. Colman has made a drastic emendation of Blake’s lines 6 and 12, which should read “Near my Bosom.” Also, the words “hears you” belong to line 10. That this poem is the last feature in Volume II of the magazine suggests that Mrs. Colman was deliberately beginning one number and ending the next number, and the second tri-annual volume, with Blake’s poems. Magazine, however, there is an illustration which includes the nurse and which is probably by the same designer (illus. 9). This illustration also may have been produced with reference to Blake’s designs. 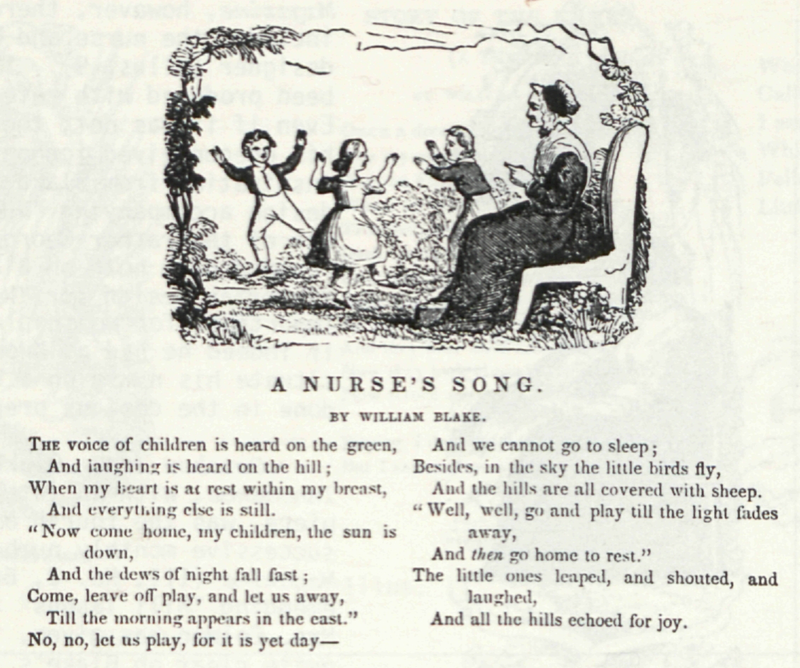 Even if it was not, the designer may have combined his preconceived iconography of the nurse with some inspiration from Blake to produce the Victorian design accompanying “Nurse’s Song.” Here the repeated use of the rather Georgian chair with its high, rounded back both on Blake’s title page and in the Victorian design for “Nurse’s Song” is particularly important, for we should expect our later designer, if indeed he had no knowledge of Blake’s design, to situate his nurse on a Victorian chair as had been done in the designs prepared a few months earlier. 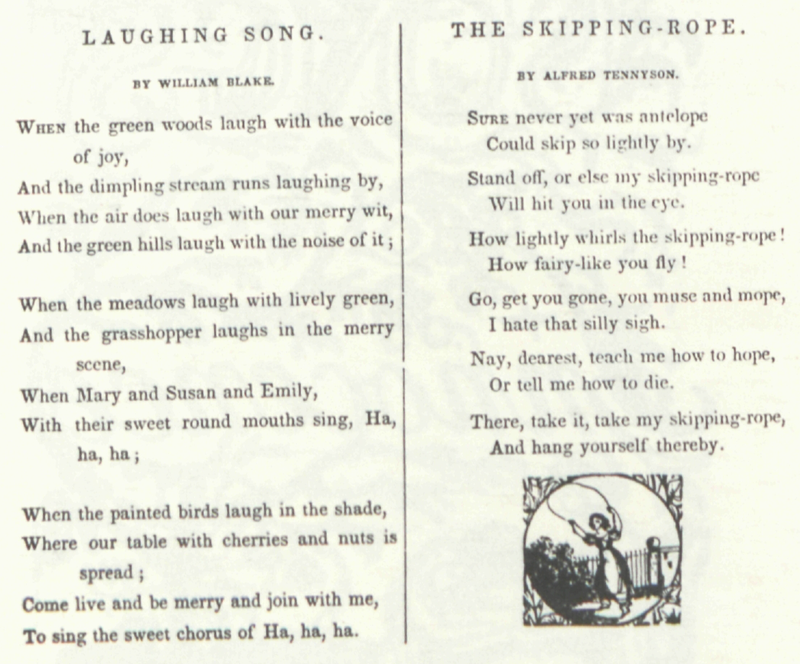 October 1843 Blake’s “Laughing Song” from Innocence, with an interesting choice for a companion piece, was the fourth of his poems to appear in successive monthly numbers of the Boys’ and Girls’ Magazine (III, No. 2, 66) (illus. 10). Besides emending “hill laughs” to “hills laugh” at line 4, Mrs. Colman has given, instead of the “He” which is quite clear on Blake’s illuminated page, yet a third “ha” at the ends of he second and third stanzas. 1843 It was probably during the latter part of this year that “Mrs. Colman” edited—and her husband and his co-publisher, T. H. Carter offered for sale—The Little Keepsake for 1844,5↤ 5 The Little Keepsake for 1844, ed. Mrs. S. Colman (Boston: T. H. Carter and Co. [copyright 1843]). The NUC (NC 0555861) lists what seems to be another copy of this same work, but which gives “Colman” of “New York” as publisher; this copy, reported by the Boston Public Library, unfortunately has disappeared from that library. which, we learn from their advertisements, was intended primarily as a Christmas and New Year’s gift. Included in this small volume are Blake’s “A Dream” and “A Cradle Song” (illus. 11). In “A Dream,” Mrs. Colman has emended the first words of several lines: “Where” to “When” at line 4, “All” to “Quite” at line 8, and “Do” to “And” at line 10. She has also given “do” for “how” at line 9, and “beetle” for “beetles” at line 19. I have found no other uses of this particular engraving, but it is very similar in style to many illustrations of animals and foliage in the Colman and Carter publications. to the Boys’ and Girls’ Magazine in subject matter and format, and which was issued in twelve monthly numbers later bound in three successive volumes. 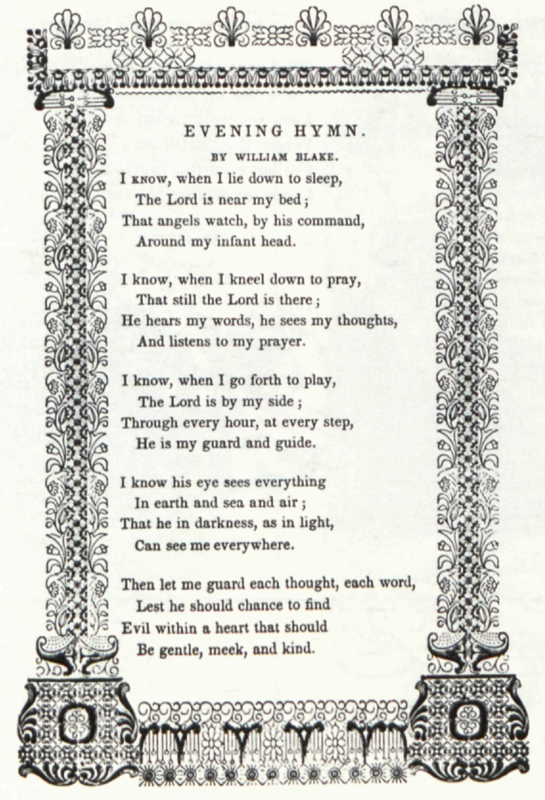 In the issue for June 1844 (II, 47) she incorrectly attributes the poem “Evening Hymn” to Blake (illus. 13). I have been unable to discover the correct attribution of this sentimental piece; the prominence which she has given Blake’s other poems and the absence of any other likely poet named William Blake indicate that she did indeed consider “Evening Hymn” and “The Lamb” works by the same poet. Mrs. Colman’s error in attribution suggests that she no longer had Blake’s original printing at hand, that she was now working with a transcription of Blake’s poems which she had apparently confused with a transcription of some other poet’s work. 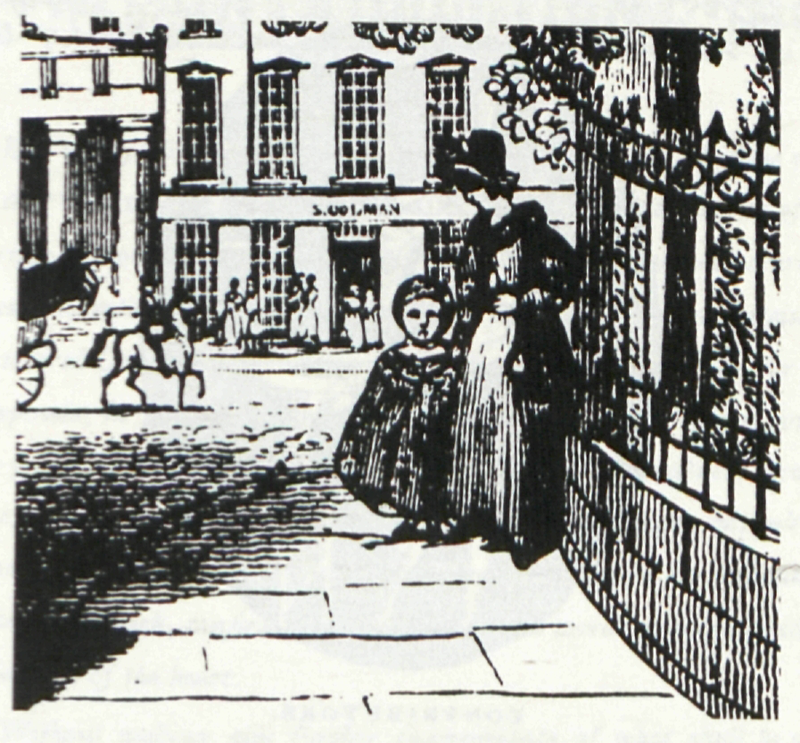 One difference between the Boys’ and Girls’ Magazine and the Boys’ and Girls’ Library is that, apparently as an economy measure, the Colmans frequently used engravings which were at hand from their earlier publications and from other sources rather than going to the expense of regularly producing engravings especially for particular texts. 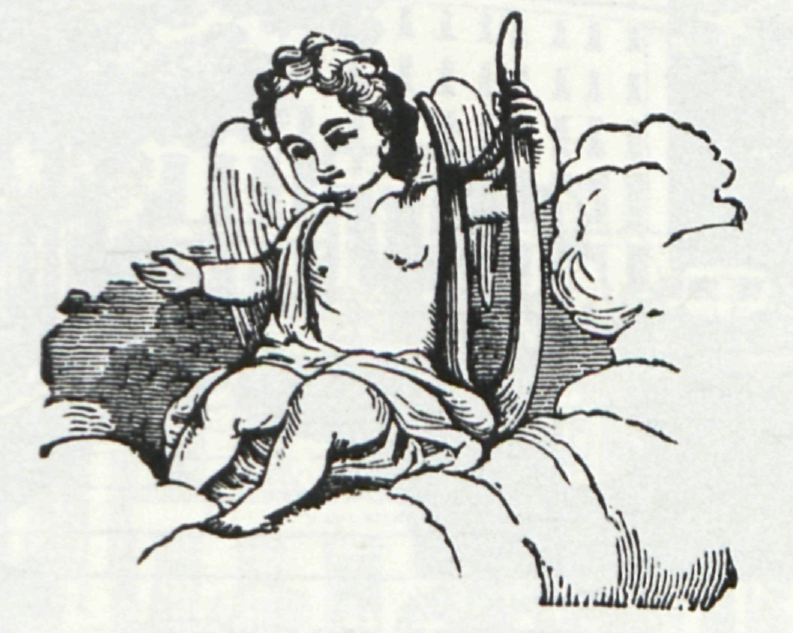 In fact, the cherub from the engraving for Blake’s “Introduction” to Innocence in the Boys’ and Girls’ Magazine for July 1843 is used in the successor publication to illustrate a piece about the aeolian harp (III, 48) (illus. 15). The availability of the engraving with which Mrs. Colman accompanies Blake’s “The Lamb” might explain why the lamb is attended in the illustration by a woman rather than by a “child” as in the text of Blake’s poem and in his design. Originally, this engraving may have been prepared as an illustration of Wordsworth’s “The Pet-Lamb” in Poems for the Little Folks (New York: Samuel Colman), p. 38, which is similar in typography and format to Samuel Colman’s New York publications of about 1839. The engraving was later put to at least one less glorious use, as an illustration for the story, “The Dwarf in Search of a Lodging,” in Miss A. A. Gray’s John’s Adventures, or the Little Knight Errant (Boston: S. Colman [copyright 1846 by Mrs. P. Colman]), p. 62. 1844 As in the previous year, Mrs. Colman compiled a small Christmas and New Year’s gift book, the Child’s Gem for 1845 (Boston: T. H. Carter & Co.), in which she included Blake’s “The Little Boy lost” and “The Little Boy Found” from Innocence (illus. 16). In the former poem, Mrs. Colman has added the word “dear” to the first line, and she has made a quite significant alteration in the sense of the poem by substituting “thick” for “away” at line 8. 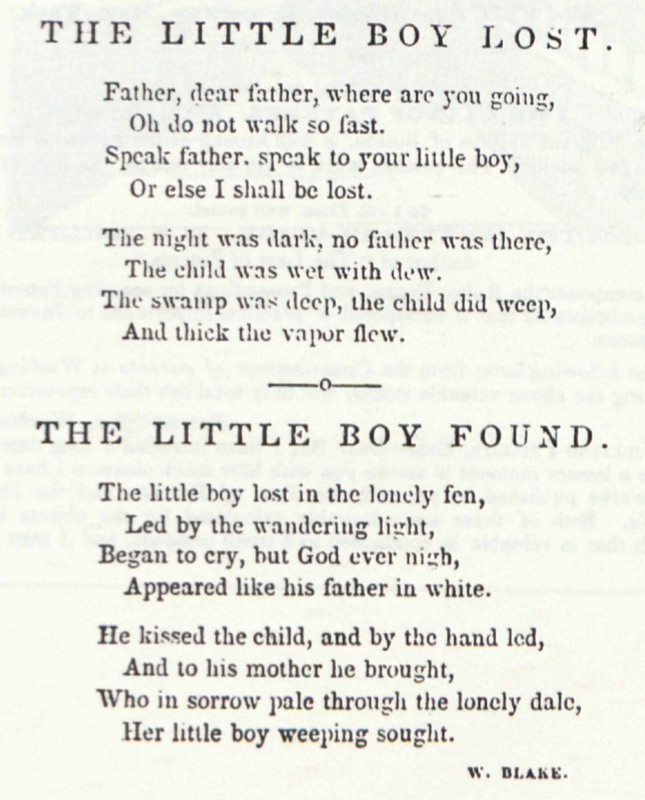 For “The Little Boy Found,” our Victorian editor’s text agrees with Blake’s except for the addition of “he” to line 6. 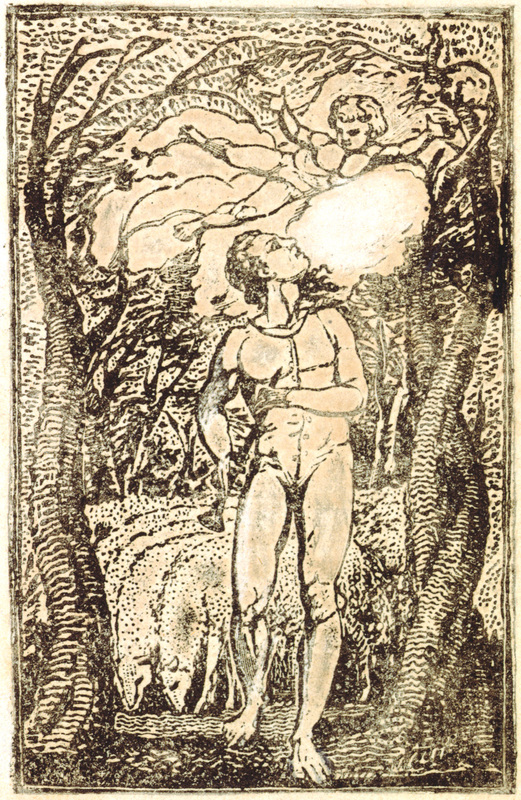 A case establishing that Mrs. Colman has taken an original copy of Blake’s Innocence as her source text would be substantial support of speculation about Mrs. Colman’s designs as a graphic Victorian reinterpretation of Blake’s art and would add to our interest in her various emendations and in her enthusiastic response to Blake’s illuminated work. Similarities between the Victorian designs and Blake’s originals suggest Mrs. Colman’s use of an original copy; further, we can establish that she had access to Copy U of Innocence in New York in 1843, and we can discount the possibility that she has used earlier letterpress versions of the poems as her source. ↤ 6 Sir Geoffrey Keynes and Edwin Wolf II, William Blake’s Illuminated Books, A Census (New York: Grolier Club, 1953), p. 17. This copy is described in detail by Thomas E. Connally in “Songs of Innocence, Keynes (1921) Copy U, Keynes-Wolf (1953) Copy U,” Blake Newsletter 28 (Spring 1974), 88-89. Although the preceding evidence documents the Balmannos’ literary activities only after 1843, it seem reasonable to assume that their association with literary circles probably began soon after their arrival in New York. It would then seem quite possible that by 1843 the Balmannos may have found their way to Samuel Colman’s successful publishing house on Broadway which was “one of the first in this country to publish illustrated books in color; and which became a gathering place for literary men and artists” (Appleton’s Cyclopedia of American Biography, III, 546), probably including Longfellow and the dramatist Willis, whom Colman published (Dictionary of American Biography) (illus. 17). There they may have loaned Blake’s illustrated volume to the publisher’s begin page 13 | ↑ back to top wife, who was then editing an illustrated children’s magazine. Of course Innocence (U) may have come to Mrs. Colman in a multitude of other ways; it is even possible that Balmanno had sold Copy U by 1843 and that she had it on loan from someone else, possibly her brother-in-law, William, a publisher of prints who was then preparing to open “the first gallery in the city for the sale of pictures” (ACAB). 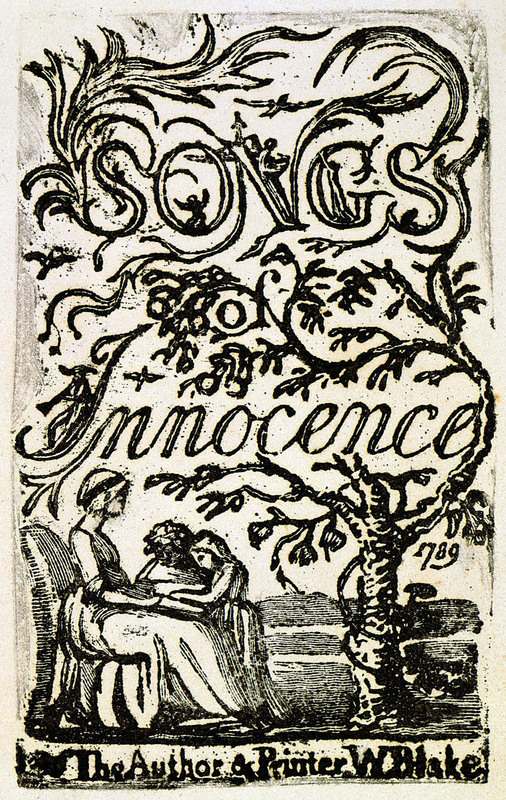 It is the combination of Mrs. Colman’s access to Copy U of Innocence together with her production of designs similar to Blake’s originals which most strongly supports the case that her source was this original copy of Innocence. The remainder of the case for Mrs. Colman’s use of Innocence (U) depends upon our exclusion of other possible sources. We can first discount the possibility that Mrs. Colman has used earlier letterpress versions of the poems. Wilkinson’s (1839) and Tulk’s (1843 or later) complete editions of the Songs were the only letterpress sources to include all or even most of the poems which Mrs. Colman prints. Tulk’s edition of only twelve copies was printed on paper watermarked 1843 and may well have been produced after Mrs. Colman’s first printing of a Blake poem, in July 1843; neither do we have any evidence that a copy was available in America.8↤ 8 Sir Geoffrey Keynes describes the two known surviving copies of Tulk’s edition (now at the British Museum and Liverpool University) in “Blake, Tulk and Garth Wilkinson,” The Library, 4th ser. 26 (1945), 190-92. We do know that at least one copy of Wilkinson’s edition had made its way across the Atlantic by 1843, for at a time almost exactly contemporaneous with Mrs. Colman’s first printings, we find in the New Church Magazine for Children (Boston: August-December 1843) five of Blake’s Songs given in a text following Wilkinson’s almost exactly;9↤ 9 Cited in my “Unnoticed Printings.” The copy of Wilkinson’s edition used by the Swedenborgians in 1843 was probably available to them a year earlier, when another Boston Swedenborgian publication, the New Jerusalem Magazine, reprinted Wilkinson’s text of “The Lamb” (16 (September, 1842), 40). copies belonging to Emerson and T. W. Higginson may also have been available at this early date.10↤ 10 In “The 1839 Wilkinson Edition of Blake’s Songs in Transcendental America,” Blake Newsletter 16 (Winter, 1970-71), Edward J. Rose discusses two copies, those of Emerson and T. W. Higginson, which may have been in America by 1843. Mrs. Colman’s texts have no recognizable pattern of similarity to the punctuation, capitalization, stanza divisions and other emendations by which Wilkinson’s texts differ from Blake’s originals. It is true that Mrs. Colman was not particularly careful with many of her texts: for example, in Tennyson’s “The May Queen” (Boys’ and Girls’ Magazine, II, No. 1, 12-13) she gives only one “black” in line 5 and contracts his “woven” to “wov’n” at line 25, both of which emendations adversely affect the meter. Yet the text in substance and accidentals clearly shows that she was cognizant, if not particularly respectful, of Tennyson’s printed text,11↤ 11 I have compared Mrs. Colman’s text to the American edition published by W. D. Ticknor (Boston, 1842). and I think it reasonable to suppose that even someone who has treated Blake’s “Nurse’s Song” as she has would betray some familiarity with Wilkinson’s version if that were her source. having been available in America at such an early date, but for our purposes, new evidence about the availability of another copy would only strengthen our most important argument: that Mrs. Colman has seen an original copy of Blake’s illuminated work. Of course we should like to know exactly which copy she used as a source text, but it is more important that her texts, her enthusiastic reaction to Blake’s works, and some of her illustrations may have been in response to the original form of Blake’s art. We must consider briefly some of the obvious problems and questions which remain in connection with the hypothesis that the designs in Mrs. Colman’s publications derive from Blake’s original illuminations. How might the design have been transmitted from Mrs. Colman in New York to T. H. Carter in Boston? Can we know who might have done the designing and engraving? A study of the signed engravings in the “Boys’ and Girls’” series of 1843 and 1844 shows the services both of Boston engravers (John Greene Chandler, George T. Devereux, Fernando E. Worcester) and of New York engravers (Alexander Anderson, Joline J. Butler, Marx M. Hart, and William Howland).13↤ 13 For information on these engravers see the NYHS Dictionary and Sinclair Hamilton, Early American Book Illustrators and Wood Engravers, 1670-1870, 2 vols. (Princeton Univ. Press, 1968). These facts put us no closer to knowing who actually designed or engraved the illustrations to the Blake poems; none of these engravers seems to have been very active as a designer, and none of the signed engravings bears a particular technical resemblance to the Victorian illustrations of Blake’s poems—but they do indicate that at least some of the designs and engravings issued from New York. 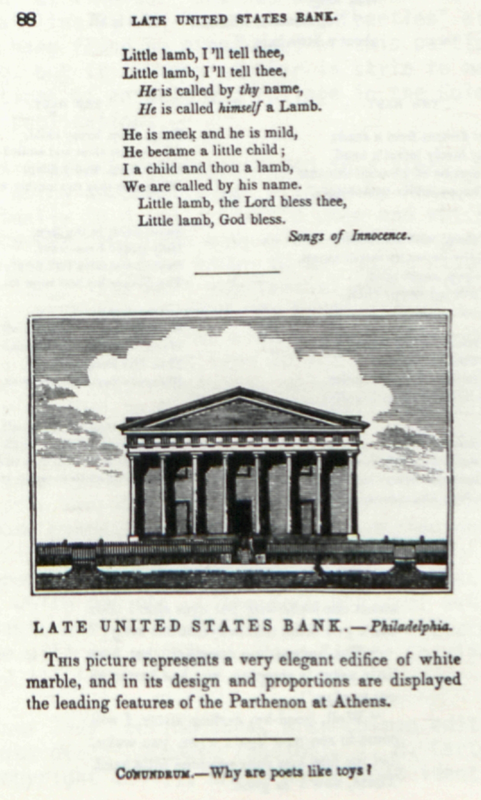 If the engravings illustrating Blake’s “Introduction” and “Nurse’s Song” were prepared in New York, we can suppose, given her prominent and deliberate display of Blake’s poems and the special production of the accompanying engraving, that Mrs. Colman may have shown the designer Blake’s original with instructions about how she would like text and illustration arranged on the page. We should also consider the immediate context in which Mrs. Colman’s readers encountered Blake’s poems. The Boys’ and Girls’ Magazine is generally representative of all four publications considered here. Although the Blake printings have previously gone unnoticed, the work has a place in the bibliography of American literature for the first printing of a Hawthorne story. In the August 1843 issue, also containing the bowdlerized version of “The Blossom,” we find Hawthorne’s “Little Daffydowndilly” (II, No. 4, 264-69), the story of a boy by this name who, through various encounters with a rather irksome character named Mr. Toil, learns that “diligence is not a whit more toilsome than sport or idleness” (269). 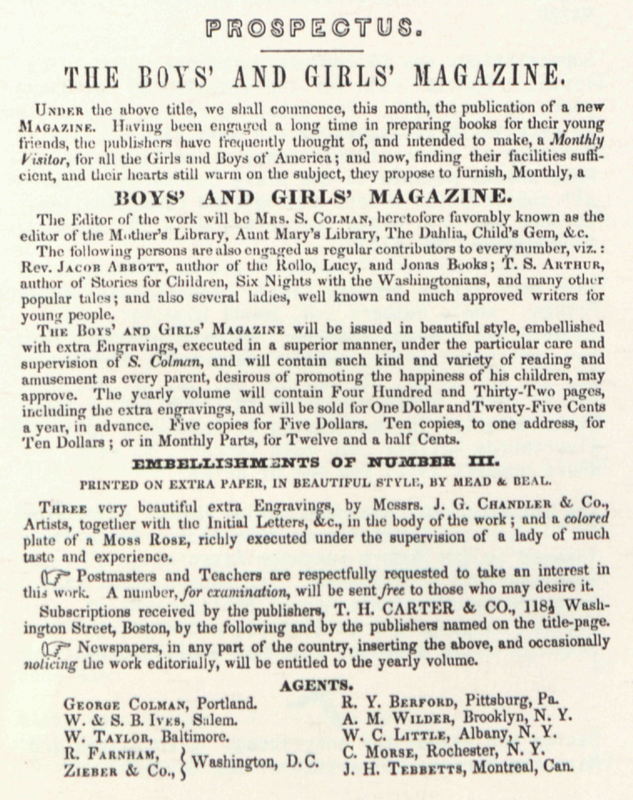 Even more important for its contemporary reputation, the magazine had as contributors some of the most popular writers of juvenile stories and verse (illus. 18). Jacob Abbott (1803-79) was a prolific writer of moral works (48 pages in the NUC), most notably The Young Christian (1832 and numerous editions thereafter) and of the extended juvenile series, the Rollo and Lucy books. Abbott had moved to New York in 1843, and his contributions may well have resulted from his personal association with the Colmans (DAB). T. S. Arthur (1809-85) was another prolific writer of children’s books (36 pages in the begin page 15 | ↑ back to top NUC), although his greatest fame came from Ten Nights in a Barroom and What I Saw There (1854), a volume which enjoyed sales in the 1850s second only to those of Uncle Tom’s Cabin (DAB). We should note that Arthur manifested an interest in Blake after his involvement with Mrs. Colman’s publications; his The Brilliant: A Gift Book for 1850 (New York: 1850) included the text of “The Tyger” and a lengthy account of Blake’s life taken from Cunningham (120-26). Later, Arthur repeated an anecdote from Cunningham in “Death of Blake, the Painter,” Arthur’s Home Magazine, 3 (March 1854), 220. The publications of Lydia Howard Sigourney (1791-1865) may have exceeded those of Abbott and Arthur combined, in number if not in length (ACAB, Vol. I, 154). In the Dictionary of American Biography we read that “it is almost impossible to find a number of one of the popular magazines of the thirties or forties that does not contain a poem or an article by her”; indeed, “the inevitable regularity with which her poetic tribute followed the demise of any prominent person led a wag to declare that she had added a new terror to death.” Catherine Maria Sedgwick (1789-1867) was on one occasion praised by her co-contributor, Hawthorne, as “our most truthful novelist” (DAB). A series of novels published from 1825-35 and marked by “extravagent and imitative romanticism” (DAB) had established her as perhaps the most popular woman author in the country, and she continued with increasingly moral works until 1857. The only other contributors to the magazine noted in American biography (DAB and ACAB) are Hannah Flagg Gould (1789-1865), and Frances Sargent Osgood (1811-50), poets whose chief works were short, innocuous contributions to magazines and annuals. 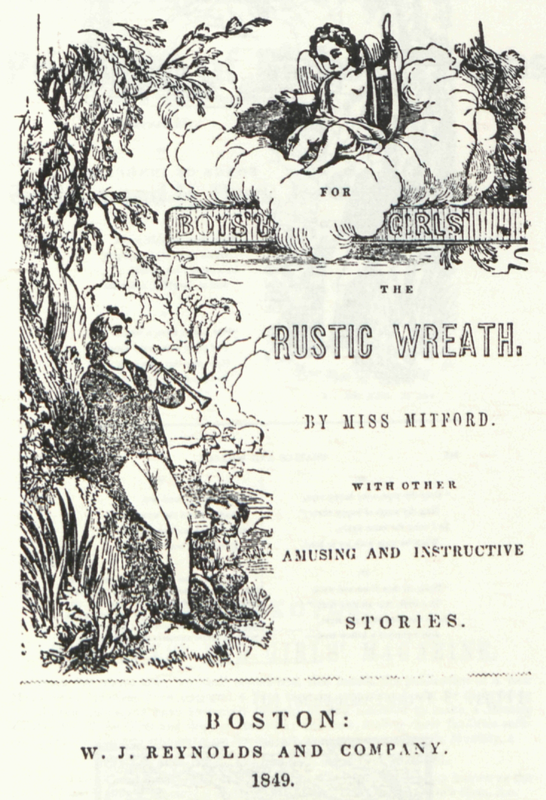 In addition, Miss Gould edited several juvenile works in this genre; Mrs. Osgood did some similar editorial work and published several volumes of verse on floral topics. Although Mrs. Colman apparently had managed to assemble for her magazines and annuals the work of many well known writers, their contributions might seem strikingly undifferentiated to the modern reader. What we might see as an oppressive lack of innovation is not really so very surprising, for the surge of juvenile literature in the thirties and forties had actually begun with a formal code set for authors and editors by the American Sunday School Union, which published 6,000,000 volumes between 1824 and 1830. Contributions were to be adapted to the children’s level, to adhere to high standards of style and content, to have an American character, and to be morally and religiously impeccable, although non-denominational14↤ 14 John Tebbell, A History of Book Publishing in the United States, 2 vols. (New York: R. R. Bowker, 1972), I, 531. (illus. 19). Mrs. Colman’s unique “edition” of Blake’s poems should also be understood in the context of American Swedenborgianism. “Samuel Colman” and “Mrs. Pamela C. Colman” of New York had joined the Boston Society of the New Jerusalem in 1833, and in succeeding years Colman advertised and sold many of Swedenborg’s works and such Swedenborgian collaterals as the New Jerusalem Magazine. 15↤ 15 A Sketch of the History of the Boston Society of the New Jerusalem, with a list of its members (Boston: John C. Regan, 1873), p. 84. “S. Colman’s List of Publications,” op. cit., p. 9. That Mrs. Colman’s Swedenborgian interests continued after 1839 is clear from her Innocence of Childhood (New York: Appleton, 1850), which was reviewed and advertised in Swedenborgian periodicals and which includes fairly direct references to Swedenborg’s teachings although the master’s name is not mentioned.16↤ 16 See especially pp. 11-24 for Mrs. Colman’s Swedenborgian interpretation of “Innocence.” A short review praising Mrs. Colman for having “managed to interweave some of the choicest truths and lessons of the New Church” into “a pleasant vein of fiction” appeared in the New Church Repository, 1 (New York, 1850), p. 50. Advertisements listing the work appeared on the paper cover of another New York Swedenborgian Journal, The Herald of Light, e. g., the back cover of 2, No. 1 (May 1858). Indeed it may well have been through the Swedenborgian connection that Colman and T. H. Carter came together to publish the volumes which are the objects of our study. Carter had joined the Boston Society in 1821 and continued as an important member in subsequent years.17↤ 17 History of the Boston Society, pp. 82, 15, 27-28, 73. The fact of the Colmans’, and the Carters’, Swedenborgianism might itself seem a circumstance unrelated to their printing of Blake’s poems except for the remarkable coincidence that almost every other printing of Blake’s poems in America before the time of Gilchrist seems to have depended upon various Swedenborgians.18↤ 18 All of the American reprintings included in my “Unnoticed Printings” are of Swedenborgian origin. T. S. Arthur, whose works I have mentioned in my text, was a Swedenborgian, as was Mrs. D. L. Child, the author of the popular Good Wives, which included sketches of Blake and Flaxman. Longfellow’s printings in The Estray (1847) may have had a source with Samuel Colman, who was one of his New York publishers before 1845. Henry James, Sr., had the poems which he reprinted in The Harbinger (1848) from Garth Wilkinson. All these coincidences may have resulted from the fact that so many Swedenborgians were involved in publishing, but I think that the evidence of specific Swedenborgian statements about Blake, especially the American view expressed in articles about Blake and Flaxman in the New Jerusalem Magazine (1831),19↤ 19 “Memoir of Flaxman the Sculptor” and “Memoirs of William Blake,” New Jerusalem Magazine, 5 (1831-32), pp. 153-60, 192-99. suggests that their Swedenborgianism gave these individuals a special interest in sustaining the memory of Blake. We should add that this same magazine was, some ten years later, the first American publication (with the exception of American editions of Cunningham’s Lives) to reprint one of Blake’s poems, “The Lamb,” in September 1842 (p. 40). 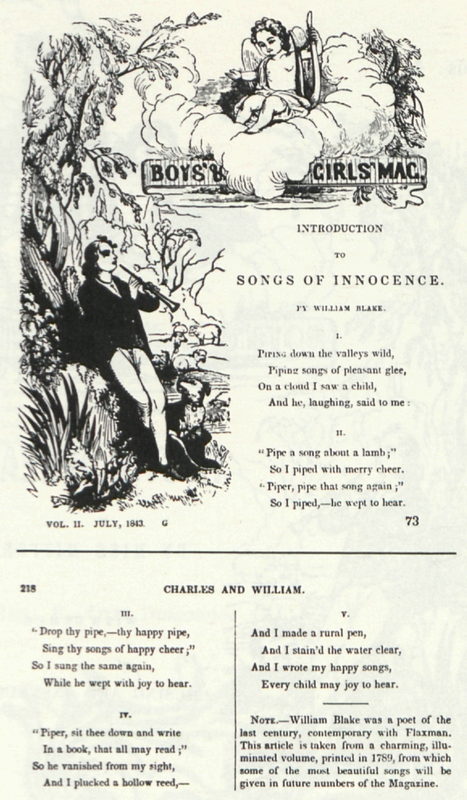 Further, in 1843 and 1844 the New Church Magazine for Children reprinted several of Blake’s Songs. Despite their criticism of Blake’s excesses in interpreting his spiritual vision, the American Swedenborgians may well have agreed with J. J. Garth Wilkinson’s argument, in the preface to his edition of 1839, that at least Blake’s Innocence represented a vision of the eternal state of childhood in accord with Swedenborg’s teachings. Mrs. Colman had joined the Boston Society of the New Jerusalem on 7 April 1833, only a little more than a year after the articles about Flaxman and Blake appeared in the Society’s publication, the New Jerusalem Magazine, and that her husband was later a New York distributor of that periodical also suggests begin page 17 | ↑ back to top that she may have known the articles. Mrs. Colman may be sharing the special interest of the other Boston Swedenborgians in sustaining Blake’s memory when she chooses to introduce so prominently to her nineteenth century readers the poems of Blake, whom, in accord with the editors of the New Jerusalem Magazine, she associates with Flaxman in her brief biographical sketch. Mrs. Colman’s Swedenborgianism also offers one explanation of her emendations to Blake’s poems and illustrations. That she gives “the Lord” instead of Blake’s “God” in the penultimate line of “The Lamb” may possibly reflect a habit of Swedenborgian expression,20↤ 20 See Swedenborg’s True Christian Religion, Section 81. but otherwise there is little evidence of Swedenborgian influence in her emendations. Although many of her small emendations are certainly due more to carelessness and to her insensitivity to rhyme and meter than to a deliberate, philosophical interpretation, a critical predisposition against Blake’s “unregulated enthusiasm” and “wild phantasy” may have increased her disregard for the authority of Blake’s given text. As for the designs, Mrs. Colman may have agreed with Blake that his arrangement of the piper and the angel were an appropriate illustration of his “Introduction” to Innocence, but instead of the naked and energetic figures which Blake may have seen in the excesses of his “unregulated enthusiasm,” Mrs. Colman has seen fit to present his design in a much more conventional and rationally acceptable manner. We should add that however strongly Mrs. Colman may have felt about the supposed Swedenborgian content of Blake’s vision of innocence, she probably would not in any event have made overtly Swedenborgian references in her emendations or in her short biographical sketch of Blake, for such reference would have violated the requirements of non-denominationalism. The reader familiar with Swedenborg’s writings can recognize as Swedenborgian the references in her publications to “Use” or to “Divine Providence,”21↤ 21 E.g., T. S. Arthur’s little story “The Delight of Use,” Boys’ and Girls’ Magazine, I, No. 3, 90-94, and a Swedenborgian analysis of the “use” of conundrums and riddles according to the concept of “Divine Providence” by “W,” Boys’ and Girls’ Library, I, No. 1, 31-32. Mrs. Colman’s contributions seem free of Swedenborgian coloration. but these are presented in such a way as to be consistent with the standard nineteenth-century Protestant view of the world. The point is that just because she makes no overt connection between Blake and Swedenborg, we should not discount the extent to which Mrs. Colman may have shared in Swedenborgian interest in Blake’s life and work and the possible significance of this interest in her decision to display prominently a number of Blake’s poems. In Mrs. Colman we have a person who, in the years of relative public neglect which preceded the Blake revival of the 1860s, found the illuminated poems of Innocence so interesting that she displayed them prominently in her publications and possibly had some of Blake’s original illustrations redesigned and engraved, thus providing us with a unique graphic interpretation of Blake’s art. The context of her little “edition” is important because it indicates some of the various channels by which Blake’s reputation survived. We see the fortuitous coming together of a copy of Blake’s poems, probably Innocence (U), with a publisher, and we see that Blake’s poems were of interest chiefly because of their openness to interpretation as lyrics intended for the delight and edification of children. Finally, Mrs. Colman’s printings reflect the special Swedenborgian interest in Blake’s life and works which helped to sustain Blake’s reputation during the years before Gilchrist. Additional notes on the illustrations. The “Prospectus” (illus. 1) is printed on the back of the paper cover in which the April 1843 monthly issue of the Boys’ and Girls’ Magazine was bound; identical covers, with the exception of the printed date and volume number, seem to have been used for all twelve issues of the publication. The original page size of the Boys’ and Girls’ Magazine, the Boys’ and Girls’ Library, and The Rustic Wreath is 6 ¾″ by 5 ¼″. The three illustrations from Innocence (illus. 3, 7, 8) are produced from Copy U, the same copy which was probably available to Mrs. Colman and which is now at the Houghton Library, Harvard University. 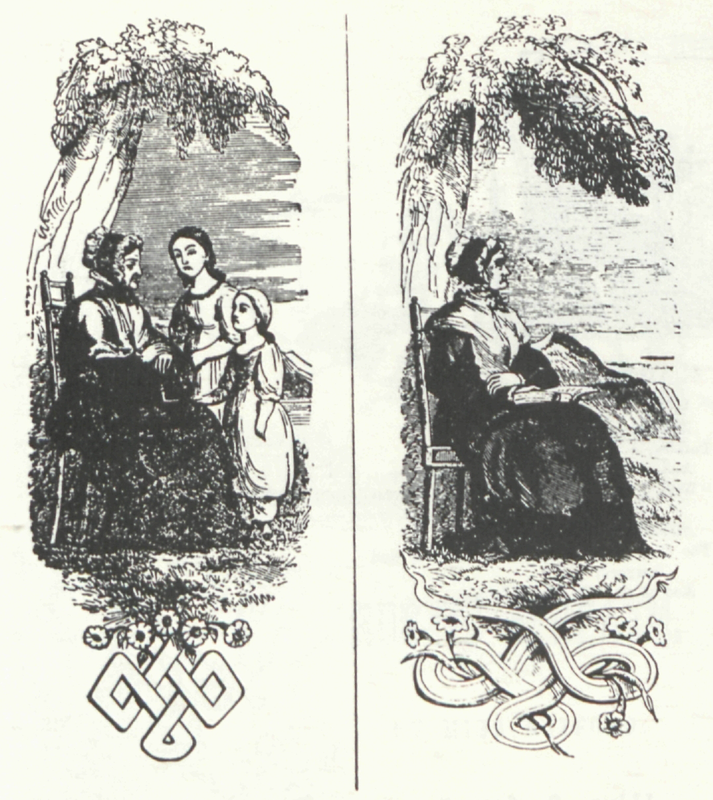 The two designs of the old woman (illus. 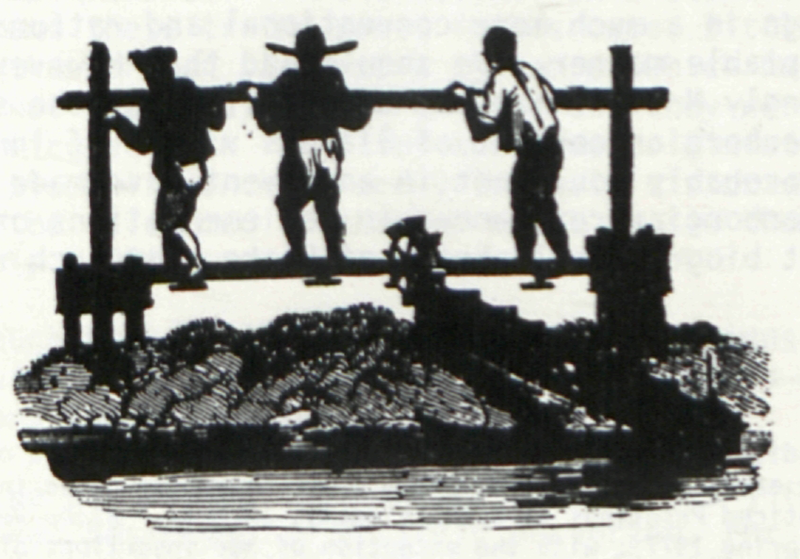 9) appear on successive pages of the May 1843 issue of the Boys’ and Girls’ Magazine (II, No. 1, 24-25) and illustrate a narrative poem, “Julia Clifford.” “A Dream” (illus. 11) appears on pages 35-37 and “The Baby” (illus. 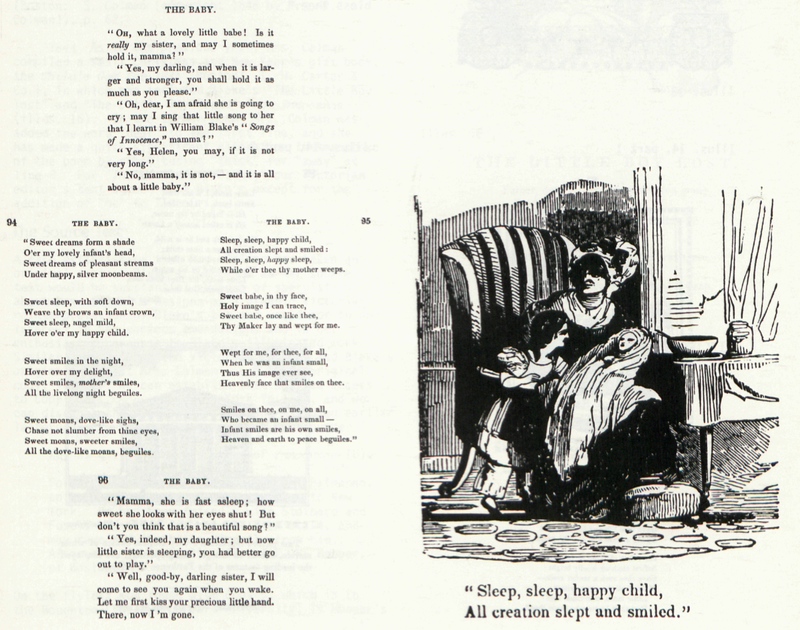 12), including Blake’s “Cradle Song,” on pages 92-96 of the Little Keepsake for 1844; the original page size is 3 ¾″ by 2 ¾″. “The Little Boy lost” and “The Little Boy Found” (illus. 16) appear on page 69 of the Child’s Gem for 1845; the original page size is 4 ½″ by 7 ¼″. 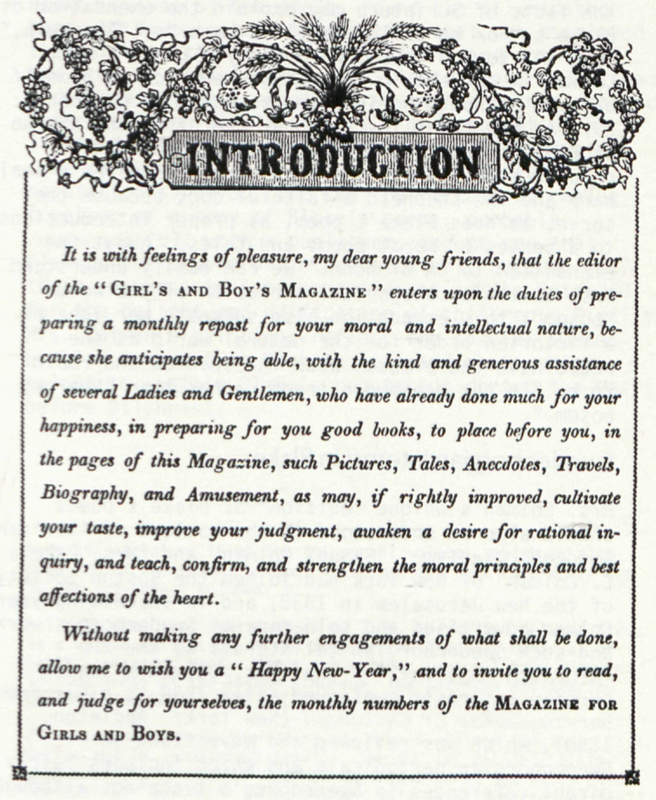 The title page of the Boys’ and Girls’ Magazine reproduced here (illus. 18) is that of the second tri-annual volume. Mrs. Colman’s “Introduction” (illus. 19) is printed on the third page of the first issue of the Boys’ and Girls’ Magazine. Illustrations are reproduced with the generous permission of the following institutions: the Boys’ and Girls’ Magazine courtesy of the Swedenborg School of Religion, Newton, Massachusetts; the Boys’ and Girls’ Library courtesy of The Boston Athenaeum; the Little Keepsake for 1844 courtesy of the Houghton Library, Harvard University; Innocence (U) courtesy of the Houghton Library, Department of Printing and Graphic Arts, Harvard University; the Child’s Gem for 1845 courtesy of the Boston Public Library; The Rustic Wreath courtesy of the John Greene Chandler Memorial, South Lancaster, Massachusetts. 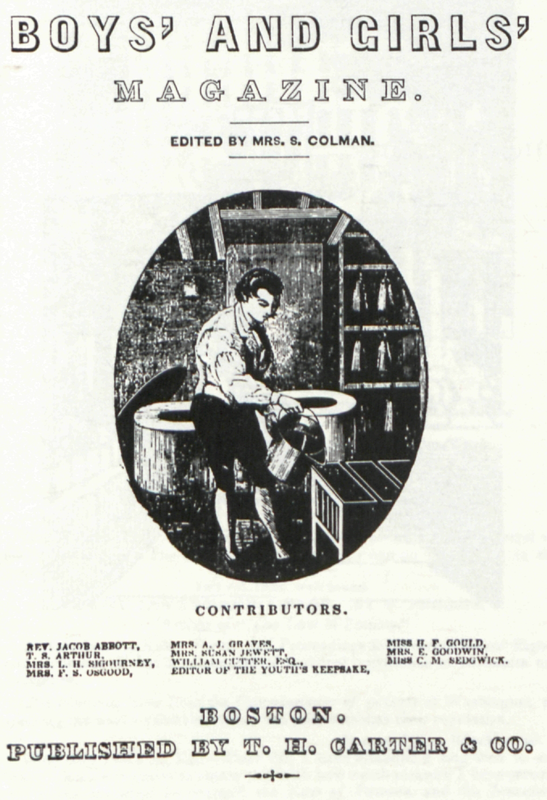 For assistance with the complex bibliographical problems presented by the material in this article, I am indebted to the staff of the above institutions and of the American Antiquarian Society, of the Margaret Clapp Library, Wellesley College, and of the Goldfarb Library, Brandeis University, particularly: Victor Burch, Special Collections Librarian, and Barton Lessin, Assistant Reference Librarian, Goldfarb Library, Brandeis University; Marian Kirven, Librarian, Swedenborg School of Religion; Herbert H. Hosmer, Curator, John Greene Chandler Memorial; Miss Eleanor Garvey, Curator, and David Becker, Assistant[e] Curator, Department of Printing and Graphic Arts, Houghton Library, Harvard University; Jack Jackson, Art Department, and Ann Wadsworth, Rachel Stuhlman, and Kathleen S. Boyd, Reference Department, The Boston Athenaeum; and Miss Eleanor Nicholes, Special Collections Librarian, Margaret Clapp Library, Wellesley College.